A new analysis of thousands of very small earthquakes that have occurred in the San Bernardino basin near the San Andreas and San Jacinto faults suggests that the unusual deformation of some—they move in a different way than expected—may be due to "deep creep" 10 km below the Earth's surface, say geoscientists at the University of Massachusetts Amherst. The new understanding should support more refined assessments of fault loading and earthquake rupture risk in the region, they add. Writing in the current online Geophysical Research Letters, doctoral student Jennifer Beyer and her advisor, geosciences professor Michele Cooke say the enigmatic behavior is seen in about one third of the hundreds of tiny quakes recorded during the lull between big damaging quakes, and their possible significance had not been appreciated until now. Cooke says, "These little earthquakes are a really rich data set to work with, and going forward if we pay more attention than we have in the past to the details they are telling us, we can learn more about active fault behavior that will help us better understand the loading that leads up to large damaging earthquakes." Over the past 36 years, the authors point out, seismic stations have recorded the style of deformation for thousands of small earthquakes in California's San Bernardino basin. They state, "Findings of this study demonstrate that small earthquakes that occur adjacent to and between faults can have very different style of deformation than the large ground rupturing earthquakes produced along active faults. This means that scientists should not use the information recorded by these small earthquakes in the San Bernardino basin to predict loading of the nearby San Andreas and San Jacinto faults." Cooke explains that the usual type of fault in the region is called a strike-slip fault, where the motion is one of blocks sliding past each other. The less common kind, with "anomalous slip-sense," is an extending fault, where the motion between blocks is like a wave pulling away from the beach, one block dropping at an angle away from the other, "extending" the fault. "These only occur in this one small area, and nobody knew why," she points out. "We did the modeling that helps to explain the enigmatic data." This is an area where Cooke, an expert in 3-D fault modeling, has done research of her own and where she is familiar with the broader research field, so she decided to try to model what is happening. She began with a hypothesis based on her earlier 3-D modeling in the area that had replicated long-term deformation over thousands of years. "I noticed that this basin was in extension in those models unlike the surrounding regions of strike-slip," she says. "The extension was limited to within the basin just like the pattern of the anomalous extensional earthquakes. That gave me a clue that maybe those faults weren't locked as they should be between big earthquakes, but that at depths below 10 km, they were creeping." "The typical way we look for creep is to use GPS stations set up on each side of the fault. Over time, you can note that there is movement; the faults are creeping slowly apart. The problem here is that the San Andreas and the San Jacinto faults are so close together that the GPS is unable to resolve if there is creep or not. That's why no one had seen this before. The traditional way to detect it was not able to do so." 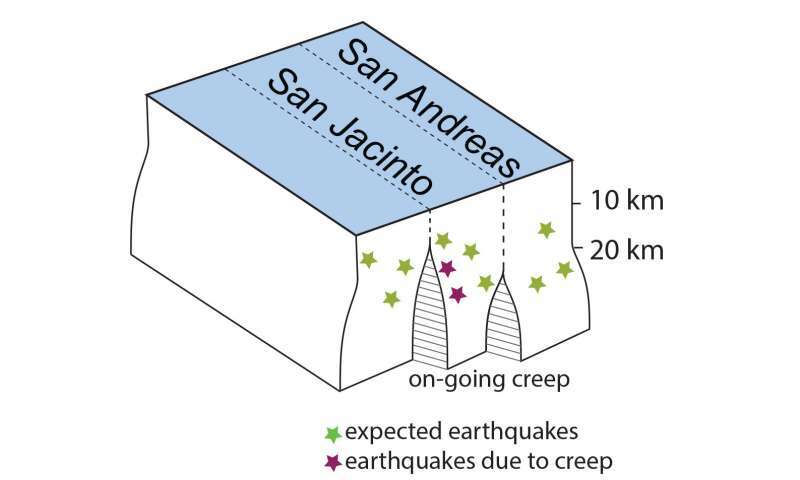 Cooke adds, "In this paper we've shown that there is a way to have these weird tiny earthquakes all the time next to the San Jacinto Fault below 10 km, which is where deep creep may be happening. We show that it's plausible and can account for nearby enigmatic earthquakes. The model may not be perfectly correct, but it's consistent with observations." As noted, this work has implications for assessing fault loading, Beyer and Cooke point out. Until now, seismologists have assumed that faults in the region are locked—no creep is taking place—and they use data from all the little earthquakes to infer loading on the primary faults. However, Cooke and Beyer write, "scientists should not use the information recorded by these small earthquakes in the San Bernardino basin to predict loading of the nearby San Andreas and San Jacinto faults." Cooke adds, "Our earthquake catalog is growing every year; we can see smaller and smaller ones every year, so we thought why not take advantage of the networks we've built and we can look at them in more detail. We don't want to wait around for the faults to move in a damaging earthquake, we want to take advantage of all the tinier earthquakes happening all the time in order to understand how the San Andreas and San Jacinto are loaded. If we can understand how they are being loaded maybe we can understand better when these faults will going to rupture."